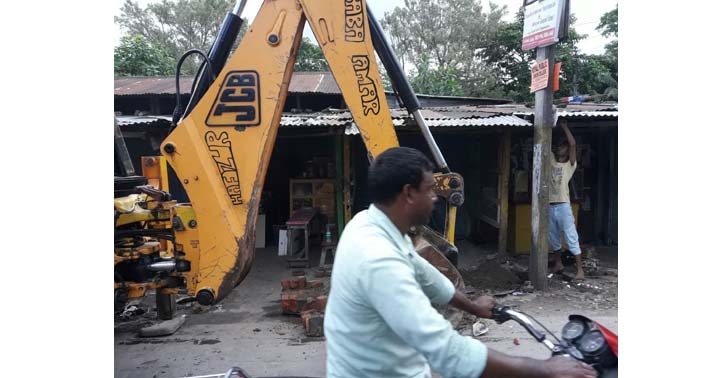 In a move to maintain cleanliness and sanitation in and around Dhubri town of Lower Assam, the Dhubri district administration on Friday launched a massive eviction drive against encroachments on pavements. Assam Governor Prof Jagdish Mukhi, during his two-day visit to the district last month, expressed concern over the lack of cleanliness in Dhubri Civil Hospital and the town as well. He termed Dhubri Civil Hospital as the dirtiest hospital in Assam and directed the officials of the district administration and the hospital authorities to clean the town and hospital within a month and assured that he would visit Dhubri within a month to take the stock of the overall cleanliness. The eviction drive on Friday was carried out from the College Road to Bidyapara via Station Road and also in the main market of the town under the supervision of Jay Shankar Sharma, Circle Officer, Dhubri and nearly 50 business establishments and more than 100 roadside vendors were evicted during the drive. The encroachers had set up their business establishments illegally on the pavements and created inconvenience for pedestrians since long. The conscious section of the people of Dhubri have welcomed the initiative that has been taken under the instruction of Ananta Lal Gyani, Deputy Commissioner of Dhubri, and urged the district administration to monitor the events continued in the future. On the other hand, various hoardings of the multi-national companies erected in the town for promotion of their products on the roadside giving an ugly look to the town are drawing the attention of the people and the local people have demanded removal of all these hoardings which are seen at every corner of the town. This has been alleged that most of these hoardings have been erected without any prior permission from the authorities concerned. Meanwhile, the re-painting of the Dhubri Civil Hospital has also been started in the wake of the Governor’s next visit. Interestingly, a month ago, just before the Governor’s visit, the hospital was painted but the same hospital building is being re-painted for reasons best known to the hospital authorities.